Did you have a dream about planets? 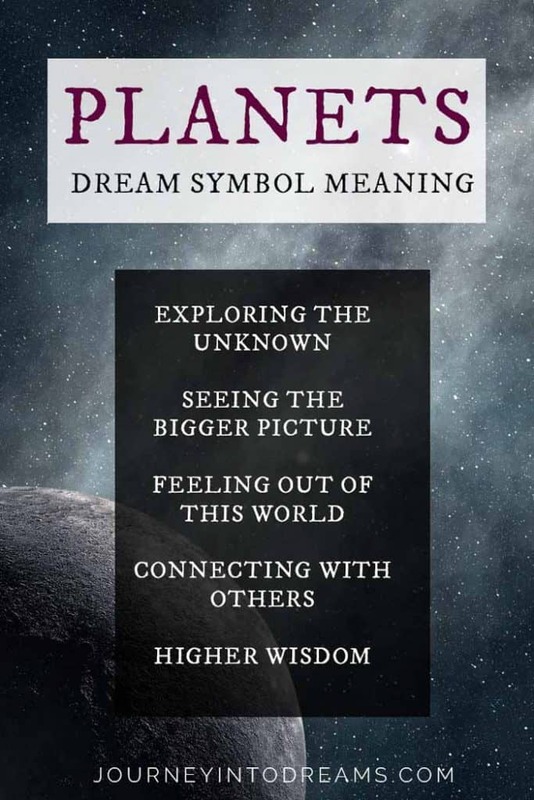 Learning the meaning of planets in our dreams can be helpful for understanding the current events happening in our life. 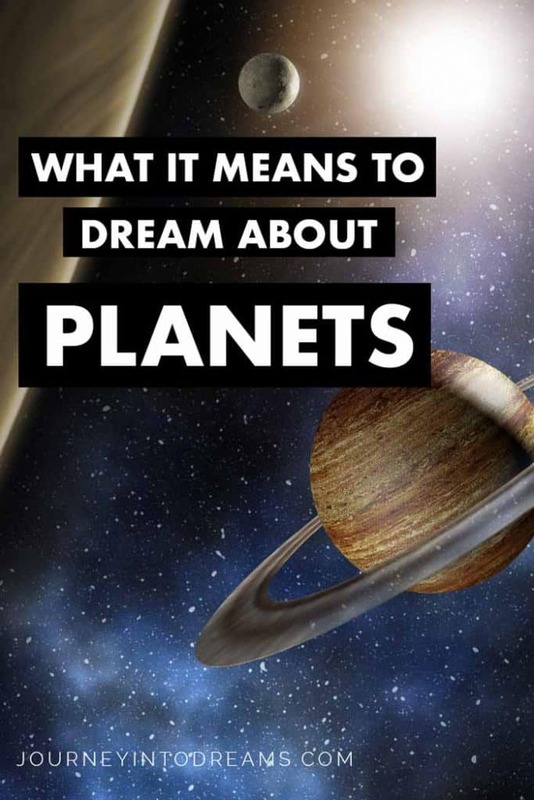 What Does it Mean to Dream About Planets? In general, seeing planets in space brings to light one's desire for greater wisdom and knowledge of the "bigger picture." Often times, when planets appear in our dreams it is a sign to truly open up to the deeper meaning of life. Your mind is becoming open to what your soul has been longing for. Looking at the bigger picture: Are you looking at life through the lens of the universe? Are you wondering how we may all be connected? Exploring Possibilities: Seeing planets from a distance in a dream might mean you are longing to explore new possibilities. This is especially true if you dream of a ufo or other spacecraft. Cosmic Connection: Often times we can dream of outer space because we are seeking connection with our cosmic and spiritual origins. It can be worth doing dream work to explore these cosmic connections to further understand what your spiritual goals and callings in this current life might be. Being Out of This World: Sometimes dreaming about planets and space can mean that you do not feel like you fully belong. You may feel like an outsider or a misfit in your current social circle. You might feel like you are not understood. Of Enormous Importance: This dream additionally reminds us that in spite of how large the universe is, we have our very own destiny to live out and the daily choices that we are making impacts that destiny profoundly. Planets are gigantic in size, so it can be a symbol of importance. Think about the impact you might have on others, or something that is impacting you. There are many ways to identify which of these meanings are most relevant for you in the dream. Journaling, prayer or meditation can sometimes help with understanding what these dreams may mean. Dreaming of specific planets in our solar system can have various different meanings, depending on the planet featured in the dream. Jupiter is often associated with personal growth and wisdom. This is a planet of truth and wisdom, and so many times when it appears in our dreams it means we are seeking a deeper truth or understanding of a situation. Often times when we dream of Jupiter, we may be on the brink of learning something very important about ourselves or others. Jupiter can sometimes be a sign of coming into enlightenment. This is a symbol for philosophy and powerful belief systems. As the largest of the planets in our solar system, Jupiter is also often associated with abundance and wealth. Many people associate it as a lucky sign for attracting money or business success. Mars is a planet about action, for better or worse. We do many things in our every day lives, and some of these things can be very good, but sometimes things we do can cause distress for others or leave us with feelings of regret or remorse. Many people consider Mars as a planet to remind you of the golden rule, which is to treat others in a way you would wish to be treated. earning ways to peacefully resolve conflicts with others will be helpful for you to move ahead in your life. It's often a sign to remind you that doing harm to others may come back to cause more harm to yourself in the long run. As a symbol for action, Mars can also relate to motivation and goal setting. If you dream of Mars, it could mean that you are trying to find a way to act on your passions in life. Perhaps you are trying to discover a way to bring your interests and the things you love into work, or you are working towards achieving success for a goal or cause you are passionate about. Mercury is often a planet associated with thinking, logic and communication. Many people consider Mercury to be a symbol of luck for business. If you dream of the planet Mercury, it can be a symbol of being deep in thought. Often times, this planet coincides with us making decisions in life and business, because most of these things require some time to contemplate. This planet can also appear to encourage you to listen to your heart over your logic. After all, it is emotions that cause us to be able to make decisions! Mercury is sometimes thought as the "problem solving" planet. When it appears to us, we usually are in a place of determining how to deal with many of the challenges we face in every day life. Venus is often associated with love and romance, but it can also be a symbol for receiving, giving and honest communication. When Venus appears in a dream, it's important to think about the current relationships in your life. Is it an equal amount of give and take? Are both parties in the relationship working towards mutual benefit? Venus also calls for us to think about our social skills. If you are nervous or feel awkward in meeting new people, this planet can often come as a symbol to learn new ways to better communicate and act with others around you. As a whole, Venus is a planet about peaceful cooperation, universal love, and acceptance. If you are open to receiving and giving love in your life, all the other little details often naturally fall easily into place. The planet Saturn in our dreams is often related to achieving success and victory. Many people see it as a symbol for business, hard work, and wealth. Because Saturn is driven for success, it will sometimes appear for someone who is looking to have more discipline in their lives. If you have a hard time resisting temptation or setting up boundaries with others, Saturn can be a powerful symbol to help remind you to set healthy limits in your life. Neptune is most often associated with creativity, inspiration, dreaming, imagination and exploration. Dreaming of this planet can be a sign that while you may have lofty goals, but you may also be very inspired and creative in your day to day life. Dreaming of Neptune can sometimes mean that you are caught up in illusions or are trying to escape. It is important to consider whether or not you are looking for something new in a creative way or if you are instead simply trying to get away from problems that may be bothering you. Uranus is typically a symbol for change and transformation, as well as a symbol for completion or evolution. It is a planet which promotes independence, and freedom. Dreaming of Uranus can often mean that you are seeking something new or different in your life. You may be looking for something "very far out there". You may also feel as if you are wildly different from others in your life. This dwarf planet is often associated with power. Many people consider Pluto to be a symbol for life, death and rebirth. It can be a sign of great creation, or absolute destruction. If you dream about Pluto, it is often a symbol for feeling powerless in a situation, or feeling as if you need to find the strength and power to overcome something that is challenging you in your life. It can sometimes also be a powerful transformation, such as feelings that emerge after an abrupt change in one's daily routine or life habits. While not a planet, dreaming of a moon can have some significant meaning in your dream. The moon is often a symbol relating to feelings, emotions, and going through the cycles of life. The moon can also be a symbol for introspective feelings and getting to know yourself deeply. Just as the moon is "hidden" during the daylight hours, often times we have thoughts and feelings we do not share with others. Our post on the moon dream meaning can help you understand more about the symbolism and messages from the moon. While also not considered to be a planet, the sun can often appear in dreams about these different celestial bodies in space. Since it is often considered to be the most important, with all planets revolving around it, this is often usually a symbol for things most important to you. Each of us can have many different personal associations related to the sun - whether you love bright, sunshiny days full of optimism, or whether the brilliance of a situation may be blinding you from the truth. If you dream that there is life on another planet, it could mean that you exploring different possibilities and opportunities in your life. Just as there may be other worlds, universes, and planets with different types of lifeforms, there are MANY different types of lives you can live on this planet earth as a human! Many times this can mean that you are exploring different choices for career, relationships, or even where to live. If you are thinking of making a big chance, this is likely a way these thoughts are manifesting in your dreams. Many of us experience dreams where we are floating. Floating in a dream in outer space can mean that you are flowing freely in your life and looking for new opportunities. Floating can also sometimes mean that you feel detached from what is going on around you. Are you currently feeling ungrounded? Sometimes this symbol of floating can mean that you need to find a way to come to acceptance with the current challenges in your life to successfully find a positive outcome. Dreaming of almost touching or touching a planet can sometimes be a symbol for goals and how you feel about reaching these goals. If you are successfully able to reach out and touch a large gigantic object floating in space, it's quite likely that you are able to achieve anything you put your mind to. The sky is not even the limit for you! Sometimes this symbol can also mean that you are aware of your own limitations and abilities. It can be a gentle message in your dreams to stay on task and to remind yourself to stay grounded in reality. Do Planets Speak to Us? Many people believe it is possible to receive messages from planets and communicate with spirits of stars and even planet earth. While of course this is not something we can prove scientifically and it may not sound very logical, it is indeed possible to tune into the energy of a planet. When you connect with the energy of the planet, it is very possible to receive feelings of emotions, thoughts, and guidance. Many people are able to carefully listen to the needs of Mother Earth and speak with the spirit of our very own earth planet which we live on. What are your thoughts? Have you had a dream about planets you would like to share? Tell us your thoughts in the comments below! I dreamt about the moon and jupiter sitting on top of a huge dark ocean and then there was a large explosion but im not sure if it was jupiter that blew up or a 3rd planet. I often dream about flying in a spaceship in space too. I have a dream that I went to planet mars,me and one man we are searching for something like gold and plant..
Last night i dreamed i was living in mars in a small house. There i miss my family and i wanted to go back to earth but it was not possible. And i got beautiful tattoo in my legs. I had a dream that I was in space watching a Stage II category of civilization in some galaxy far in the outer space near to a planet that looked like Venus but 6 times larger. And at that same instance, I saw Jupiter Explode! What does that really mean? i had a dream where i watched from my house in the sky, and the full moon was so close and big to the earth .then i saw on the moon human face, and suddenly soome kind of rocks and little drones or little airplanes idk but just a weird unexplainble dream….. before all of that there was rain …. 🙂 any explanations ? I dreamt of a solar system and two new planets but I was seeing the same on a mobile screen with jupiter as the mid planet. OMG I had the same dream. I looked out through my bedroom window and I saw planets extremely close to me. I remember vividly seeing saturns rings and how beautiful everything looked. I grabbed a friend to come look, then we were seeing the solar syatem and floating towards it. I dreamed all of planets in the morning sky. The hours around 4AM or 5AM outside. Like 7 times row now. I want help… Please reply my twitter. I dream about a planet and it started warping into space , and everything was being sucked into a different dimension. I was in a super market with my family and it was in space or ant night I don’t remember so we saw Saturn and it was gliching we saw little people on horses leaving Saturn my sister said they were real but my mom didn’t believe her. I had a dream I turned into a planet with people on it and everything. And I was orbiting inside my old room I had when I was a kid.